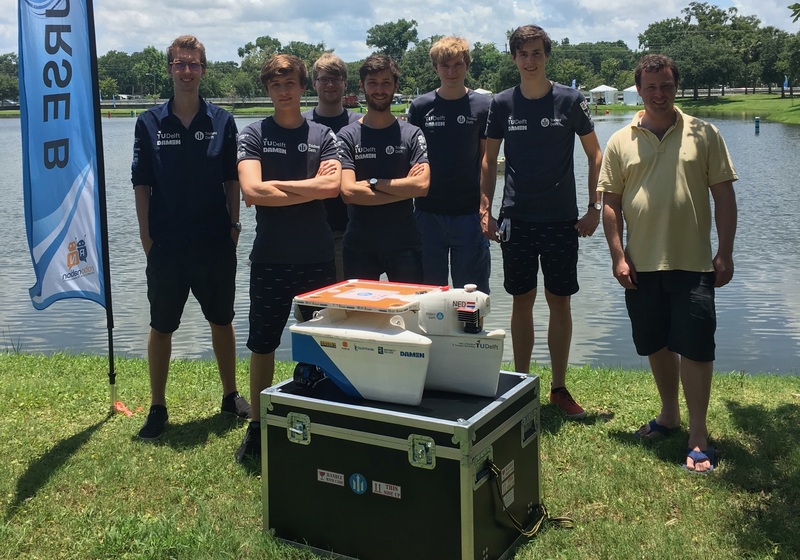 From 18 to 24 June 2018, the ‘Trident Delft’ team will be battling against student teams from all around the world in the International RoboBoat Competition in Daytona, Florida. 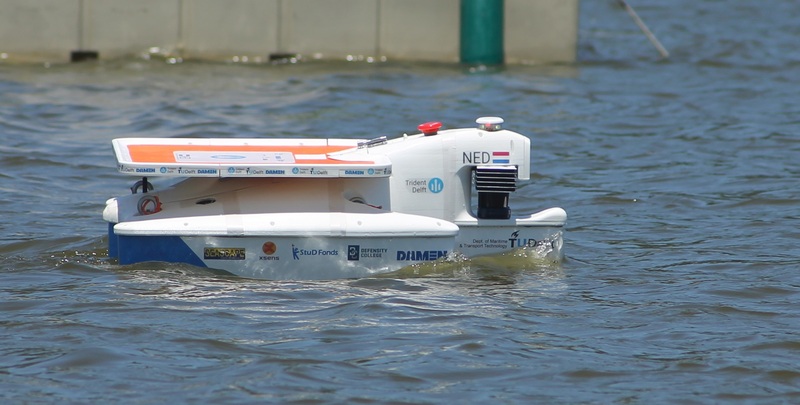 The team of six students from Delft University of Technology has built a boat that can navigate and perform certain other tasks autonomously. The students presented their initial Trident prototype in January, upon completion of the Robotics minor at Delft University of Technology. They spent the following months getting the boat ready for the Florida RoboBoat competition. Trident is 75 x 52 centimetres and weighs approximately 12 kg. It notches up speeds of approximately 1.5 metres a second. The team opted for a trimaran shape, due to its stability. This is important in light of the numerous on-board sensors, which transmit data to a computer in the hull of the boat. The computer uses this data to navigate. Trident steers using differential thrust – a system in which, for example, one propeller thrusts forward while the other thrusts in reverse. From 18 to 24 June 2018, the ‘Trident Delft’ team will be battling against student teams from all around the world in the International RoboBoat Competition in Daytona, Florida. Trident and its rival boats will have 20 minutes to navigate an aquatic course. The vessel needs to perform several tasks as quickly as possible on the course; these include docking and undocking, avoiding obstacles and passing through gates. "This is the first time that a team from Delft has signed up, so we had to start from scratch"
“We are really looking forward to taking part in the competition. This is the first time that a team from Delft University of Technology has signed up, so we had to start from scratch. It is sure to be tough, as the other competitors have previous experience”, says IDE student Timothy Puglia. Update: the team ended 5th and won the static judging price! During the competition they ran into all sorts of problems, but were able to reach the finals. Unfortunately their IMU broke just before the final run and they ended 5th. But the teams were not only judged on their performance in the finals. At the beginning of the competition they were judged on the design of their boat, etc. This is where they got first place and went home with a cheque of $1000. Congratulations to the team with the 5th place and static judging price!